Starting with the catchy Ice Cream, we get an arresting hook with the rollicking guitar riffs and Pancham style quirks with Himesh growling his lines. But whenever, Yo Yo Honey Singh chimes in with his rap verses, it all seems a bit out of place with the retro stylings of the song. Rapping about being a super-cop and impressing the girls is his Singh’s forte, but it just jars with the tone of the song. The lyrics by are appalingly bad with “Ice cream khaogi, Kashmir jaogi…” being the ridiculous chorus that I can’t help but sing against my better judgement. It’s a catchy song with Himesh chiming for the addictive “Oh Meena, Oh Zeenat, Oh Salma” in his best Pancham growl. It’s admirable, though some may be turned off by the reappearance of his voice, I tend to love it! As always Himesh commissions a remix for all songs, this remix version by DJ Kiran Kamath does an okay job of speeding up the tempo of the track, but it loses that retro edge that distinguished the original. Next is, Dard Dilo Ki, a melodious and haunting track that borrows a few bars from the monster hit Tum Hi Ho. While this lift didn’t bother me too much, it may be jarring for other listeners who may pick up on the similar orchestration. Mohd Irfan brings the pathos and sadness with his measured delivery on Sameer lyrics. The lyrics by Sameer are quite notable in not being his usual schmaltzy style, which is good to hear. Irfan’s voice works perfectly with the minimalist elements of the piano and accordion. This time Himesh lets the song unfold at a slower pace without adding too many arrangements that may have cluttered the song. It’s definitely one to keep on repeat. The Reprise Version is actually a very cool redo of the song, as it adds an addictive thumping beat, as well as amping up Neeti Mohan’s verses where she spells the film title. It makes the song a bit sexier and more contemporary, which is a different spin on this more subdued song. If you want your sad songs dialled up a notch, then dance to this version. There’s also a Remix Version, which integrates a small dialogue from Irrfan Khan which is a nice throwaway quirk for the track. It’s a decent remix though it does make Irfan’s vocals seem a bit too warbly. One of the biggest surprises is listening to Yo Yo Honey Singh crooning and trying to subdue the swag in his voice in Hai Apna Dil Toh Awara! It’s an interesting track that opens with Singh warbling about how lonely he is in his city, with a soothing piano-guitar melody that makes the song retain its retro flavour. We’ve never really heard Singh croon in quieter tones, which makes this a track worth savouring. Himesh chimes in soon after with his voices, and his high pitch almost disrupts the melodious song but then he starts singing in a very smooth way, which will impress critics who don’t like his nasal twang. The song has a Desi Version, which goes for more of a dandiya route with the thumping beats. It doesn’t really mesh together as Himesh has just peppered the beats around the main verses in a way that doesn’t sync up. However, I’ve been playing the Blues Mix more often because it is a wicked rendition of honkytonk blues with the jaunty guitar and drums. It certainly fits with the time, and I’d almost wish they had used that for the film version. Keep this one on repeat. For the irritating Catch Me If You Can, there is a cavalcade of singers like Mohit Chauhan, Shalmali Kholgade, Shubhangi Tiwari who get lost amidst the cheesy beats. The song is catchy but it’s almost as if the rules were, ‘sing as loud as you can and we’ll record that’ which accounts for the shouty track. It doesn’t help that the song suffers from a “Dhan-te-Nan” hangover with Mika Singh bellowing out the line. For once, the Remix Version doesn’t add the electro beats but slows down the tempo slightly so we can hear snippets of these relegated singers. Just avoid the original and go for the remix. We land up with a favourite word of Himesh’s for the next track, Surroor, which is a lovely and haunting number that stays with you. The arrangements are fantastic here, with the guitar, flute, and orchestra intertwining for a gorgeous melody, with Shalmali Kholgade, Yo Yo Honey Singh, and Himesh sharing the vocals. Himesh’s voice tends to reach the higher pitch when he creates the emotional songs, so I didn’t mind his vocals here as they convey that ‘dard.’ Kholgade impresses with her short verses near the bridge, as well Singh comes in at the end to add some of his charm to the song. The song features an interesting Arabic Mix, which adds more drums, and violins to give that spice. There is an odd interlude in Spanish that doesn’t fit and comes off as annoying, whenever it comes on as the singer sounds like a football announcer! The song adds more orchestration with the trumpets and upbeat tempo, but these beats are mostly typical Middle Eastern beats, which makes you wonder why that warranted a redo? As always there’s the remix version, which actually sounds alright in spite of the jaunty beats, and it gives you a bit of a throwback to Himesh’s early millenial remixes. The flute melody is retained throughout to give it that extra edge. Sheeshe Ke Samundar is another stunner, which makes you adore when Himesh lays down the cheesy electro beats and really crafts a song that has the punch to it. This track is a lovely romantic number with Ankit Tiwari who conjures up his Aashiqui 2 tragic voice for this one. Tiwari is able to salvage the clunky lyrics by Sameer, who veers from eloquent to stiff throughout his songs on the album. The remix version is nothing to write home about, it manages to wreck the mood created by the original into a noisy remix. The song features a Reprise Version with Rekha Bharadwaj which is simply wonderful with its understated raag. Himesh throws in more tabla, and layered beats in the background which allows him to show off his attention to detail. This version is far better, because Bhardwaj and Reshammiya create a perfect harmony here and it helps that this is a nice follow-up to their collaboration “Piya Jaise Laddoo” from Radio. Keep this soulful track on! The Xposé Mashup manages to make some of the songs sound ridiculous with the cheesy beats and distorting Himesh’s voice into a squeaky chipmunk in the beginning doesn’t help in taking it seriously. It ended up making me laugh very loudly on the bus, which is likely not the reaction Himesh wants from it, but it’s just that silly, so avoid. 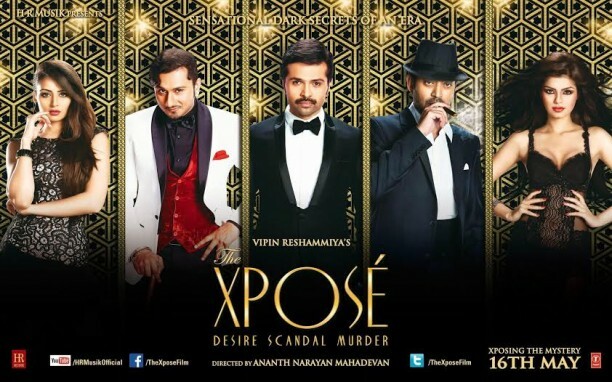 The Theme of Xpose starts off well with Irrfan Khan reciting some lines from Sheeshe Ka Samundar, which lead in to Neeti Mohan once again spelling out the film title. The song is catchy with the screwdriver electro sounds, and funky beats, which fade out whenever Khan chimes in to recite a verse. It’s a good note to end the album on, as it stokes the listeners interest. The Xposé is a fun album that could have been 8 tracks shorter if Himesh had not created such futile remixes. In spite of this gripe, the album showcases that Himesh’s versatility with romantic tracks and turning our assumptions of Yo Yo Honey Singh’s style on its head, for that I’m thankful. 16 queries in 0.487 seconds.